Flow cytometric analysis of Jurkat cells, untreated (blue) or treated with Anisomycin #2222 (25ug/ml, 30min; green) using Phospho-SAPK/JNK (Thr183/Tyr185) (G9) Mouse mAb (PE Conjugate) (solid lines) or concentration-matched Rabbit (DA1E) mAb IgG XP® Isotype Control (PE Conjugate) #5742 (dashed lines). 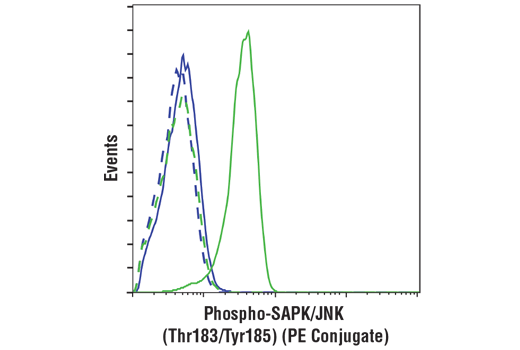 Phospho-SAPK/JNK (Thr183/Tyr185) (G9) Mouse mAb (PE Conjugate) detects endogenous levels of p46 and p54 SAPK/JNK dually phosphorylated at Thr183 and Tyr185. This antibody does not recognize endogenous levels of phosphorylated p44/42 MAPK or p38 MAPK. Monoclonal antibody is produced by immunizing animals with a synthetic phosphopeptide corresponding to residues surrounding Thr183/Tyr185 of human SAPK/JNK. The antibody is purified by affinity chromatography. This Cell Signaling Technology antibody is conjugated to phycoerythrin (PE) and tested in-house for direct flow cytometry analysis in human cells. The antibody is expected to exhibit the same species cross-reactivity as the unconjugated Phospho-SAPK/JNK (Thr183/Tyr185) (G9) Mouse mAb #9255.